Its nice to be back after a much needed blogging break. Hope my dear readers have had a great start to 2012. 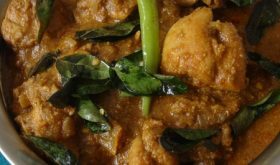 A few days ago, while sifting through my large collection of hand written recipes for a traditional style chicken curry, I found a family recipe for chicken curry given to me by a dear friend who belongs to Konaseema region of Andhra. 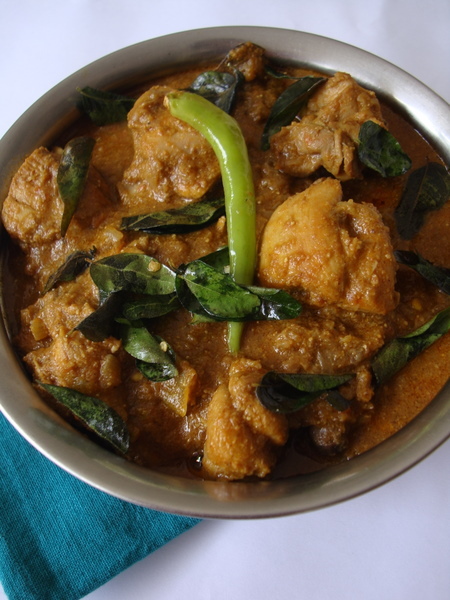 I’m assuming that this version of chicken curry has its origin in Konaseema. One thing, I can assure you, dear reader that it is an absolute winner of a recipe. 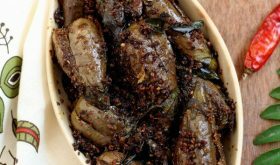 Makes for a great accompaniment with flavored rice, biryani or rotis. Heat oil in a cooking vessel, add the onions and saute till pink. Add the green chillis, ginger-garlic paste and saute for 4 mts on medium heat. Add the cleaned chicken pieces and cook on high heat for 5-6 mts, mixing once in a while. Add the turmeric powder, coriander powder, cumin powder, red chili powder and salt, mix well. Add the ground paste and tomato puree and mix. Reduce heat to medium, cook without lid for 7-8 mts. Add half a cup of water and cook covered for 20-25 mts or till the chicken is cooked. Add the coconut milk and cook without lid for a few minutes till you get the desired gravy consistency. Finally add the garam masala pwd, mix well. Turn off heat. 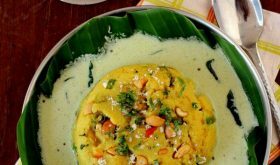 Remove onto a serving bowl and garnish with curry leaves or fresh coriander leaves. 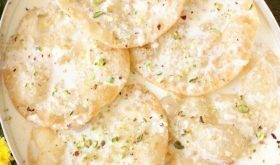 Serve warm with steamed rice, rotis or flavored rice or pulao. You can follow the pressure cook method to quicken the cooking process. Once you add coconut milk, do not pressure cook. Let it cook without lid till you get the desired gravy consistency. Good to see you back, been missing your recipes! One question… I don’t have coconut milk , Could i substitute grinding grated coconut to paste?? You can grind the grated coconut adding a cup of water and extract the milk. Alternately you can add 2 tbsps of coconut paste and 3/4 cup water. Welcome back! Hope you have a great start to 2012 too. Chicken curry with peanuts is interesting and I shall try it out soon. 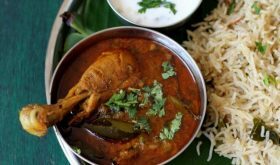 Oh good – I have been trying my hand at the Andhra Bhavan chicken curry that we love. Now I have the true recipe! Hey I tried out this dish, it was indeed awesome, my husband luved it. Thanks for sharing. Very tasty and easy recipe,thanks for the recipe, can you please post more chicken recipes. Tried this recipe last week for a dinner party. Was well received. Thank you. Hi Sailu, I made it for dinner tonight with slight modifications.. came out really well! Loved that it had quite a different taste than the regular curries I usually make (peanuts+poppy+sesame = goodness!). thanks for the recipe! 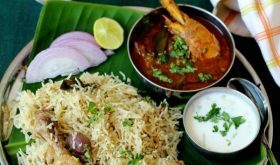 hii..can i use the same recipe to make mutton…will it taste as tasty as chicken curry.. I tried this today!!! Smells so good!!! Waiting to eat it….again, please may I post the link on my blog? Yes, you can post the link on your blog. Thanks! The curry was awesome!!! Please keep posting !!! Made this superb dish last night.Huge hit polished off.Sharing with my family and crew.Kudos mysterio marvel. Making this tonight! looks a winner to me too….and yeah no Poppy Seeds here too…Would try if I can get Melon seeds instead…. Looks yummy! Would love to try it out soon, just have 1 doubt…. how long to dry roast? You are welcome. 🙂 There is no need to roast the melon seeds. What is put in ground paste? Please go through ingredient list. Too spicy for me. I had to skip garam masala altogether. Next time I will have to cut back on even more spices in the recipe.